Poem: “After Reading T’ao Ch’ing, I wander Untethered Through the Short Grass,” by Charles Wright (from The Writer’s Almanac). And last: The Bay Bridge is closed tonight. Closed, completely. For four days. 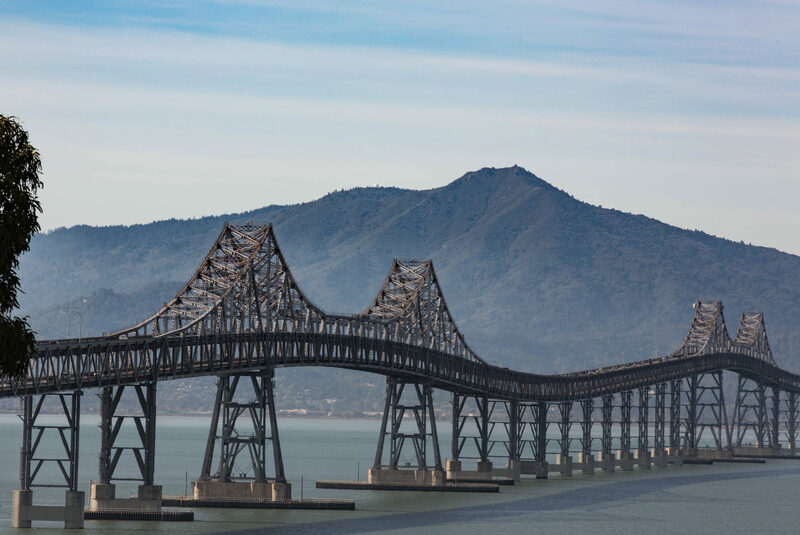 As part of the generations-long project to make the bridge seismically sound, the California Department of Transportation (Caltrans, not Caldot) has shut it down for the holiday weekend. That’s all the time it needs to demolish a section of the bridge on the Oakland side of the Yerba Buena Tunnel and slide in a pre-built piece to replace it. The last time the bridge was closed so long: 1989, from October 17 to November 17, after the Loma Prieta Earthquake lifted up the east end of the bridge and let it drop, causing a section to collapse. That was a generation ago, and we have a ways to go before the bridge rehab and rebuild is complete. Oh, and give me a holler if you see those keys. Once, way back in the first half of the ’90s, when the World Wide Web was really a new thing, I was asked to participate in a conference for science journalists. My expertise derived from being a newspaper editor and from my early dabbling in online stuff, and believe me, it was only dabbling. I was on a panel with a couple other editor types, and the subject was the impact and promise of the Web for journalists and journalism, or something like that. A question came up about whether the Web would give individuals the ability to follow their own paths — to become self-publishers. I was not and am not a seer, but I said it was undoubtedly true that the Web would create such opportunities. I wasn’t sure that would make anybody a living, much less make them wealthy. After all, I said, the world has never been short of opportunities to get poor doing something you love. It’s just that sort of entrepreneurial acumen and spirit that has built my current publishing empire. Now: I’m sure those of you who read regularly have noticed that I sometimes ride a bike and sometimes blog about bike-related matters. I’ve thought about doing a new blog or site devoted to all this cycling stuff I do and pay attention to, and to try to make it something that goes well beyond what I’ve done already. Maybe do some product reviews and book reviews. Try to track the most important news of the day. Include fitness and nutrition news. Offer a full gamut of riding advice, from what to do in traffic to what are the best cross-country tour routes. Try to involve some other people, at least as occasional contributors, and make the whole thing both down to earth and written with voice and humor. Oh — and it would be commercial, to some extent: I’d take ads and look for other ethical money-making opportunities. One issue, writing down these general ideas, is that I know at least one other site doing this kind of thing: RoadBikeRider.com. It’s done by a really veteran crew from Bicycling magazine once upon a time. There are probably others out there that people might now and could point me to. The point about that is that, in the language of startups, one needs to have some points of differentiation with such potential competitors. “Being better” is not a differentiator, because that’s what everyone sets out to be. “Being free” might be, if you can really pull that off (RoadBikeRider, for instance, uses its weekly newsletter as its come-on to pay for membership; all the good stuff is available only to paying customers). Not to get too far ahead of myself, though: Today what I can easily do is set up a blog (a very crude beginning effort is here); yeah, the name — re: Cycling — needs work. On the Bike? I haven’t come up with anything snappy, and Bikezilla is taken. I can set up a Google ad account. I can begin thinking through the basics of plans for business and content. What I’d find really helpful, though, is any feedback and ideas people have on useful or attractive features. Like U.S. Senator Larry Craig, R-Idaho, I want to assure my constituents that I have never Bengay. Flying back from Paris on Saturday, our Air France 747 crossed southern Greenland. It’s one of the places I’d love to visit — to see the site of the medieval Norse settlements, if nothing else. The sight of the place makes a strong impression: A good 15 minutes, or more than 125 miles, before we got to the southeastern coast, individual icebergs appeared in the blue North Atlantic below. Then more and more appeared, as did their source: the glaciers snaking down from the island’s highland ice sheets to the bays on the Atlantic. We saw the glaciers calving dozens, hundreds, thousands of icebergs; icebergs that in some cases were the size of big Midwestern farms. The temptation in the time of “An Inconvenient Truth” is to see the masses of ice floating south as evidence of What We’re Doing to the Planet. The facts are much more complex: The glaciers have always calved icebergs in volumes that would amaze the first-time beholder; there’s likely a difference now from 1912, say, when one particularly famous iceberg trundled out to sea, but it’s not visible from a single pass in an airliner. Still, we can be reasonably certain that though the differences in the ice’s behavior might be subtle on a discreet level — this is what I saw on one day — they likely represent something profound about planetary climate. Prompted partly by curiosity and partly by one person’s stark and dire summary of what’s happening around us today and our responsibility for it, I decided to calculate the carbon footprint of our August trip. I’m trying to account just for the big stuff — 4,000 miles of driving in an SUV that averaged 22 or 23 miles per gallon and three long plane trips. I’m not counting any of the electricity we consumed along the way or the cost of transporting the Pringles we bought from the Pringles works to the Rockies. A calculator available on a site affiliated with “An Inconvenient Truth” suggests that the national average of carbon dioxide emissions per person in the United States is 7.5 tons (another site, CarbonCounter.org, comes up with a significantly higher number, 21.2 tons; other estimates, when they’re stated in a straightforward way, fall between these numbers ). Based on running our numbers for the trip, I come up with an estimate of 3.65 (from the “AIT” site) to 6.65 tons just for the 25 days of our travels. One surprise, to me, is the high figure for air travel, which the various calculators estimate at 2 to 11 tons of carbon dioxide for the flights we took (two long trips — five and six hours — and one extended one, 11 hours). A lot of these calculators invite you to enter into a contract of some kind, ranging from “I’ll stop throwing away aluminum cans” to making cash payments, to lessen or offset your carbon impact. I even found a site, JunkScience.com, that has an alternative calculator that shows what a pitifully small impact your offset payment will make (the site’s subtext: global warming just ain’t that big a deal, you saps). Bottom line, whether I can do anything to lessen the impact or not: We spewed out more than our share of CO2 during our little jaunt. Got up at 5 a.m. to get ready to go to the airport for a 10:15 a.m. flight. The easiest way to get there would have been a 60 euro cab ride — that’s about 80 bucks — but the nice clerk at the hotel found yesterday that no cab company had a car big enough to take my bike box. So that necessitated hauling my unforgivably heavy suitcase, with rollers, and my inconveniently piece-o’-pie-shaped bike box (visual aids will be provided) the quarter-mile or so to the nearest regional train (RER) stop, across the street from the Luxembourg Gardens. I’ve found Paris in August to be a city that’s late to bed and late to rise, so I knew I could probably haul my luggage right up the middle of my hotel’s little street; after that, the wide sidewalks on the Rue de Virgiraud would suffice. I knew I could pull the two pieces at the same time because I did it when I arrived here 10 days ago; then, however, I had a nice convenient bus ride from the airport, and my bike box rode in a truck with those of all the other PBP types. I went downstairs from my seventh floor room in the hotel’s tiny elevator, just big enough for me and my suitcase. I paid my bill, pulled my suitcase out to a likely place on the curb, then wrestled my extra-large piece o’ pie out to the street. I lined everything up and started pulling. At the top of the street, the Rue Casimir Delavigne, is the beautifully restored Theatre Odeon. A stationwagon taxi drove a slow circle around the Place de Odeon, and I hoped the driver would see an easy fare and stop. But he didn’t. I continued up to the deserted main street, leaving the bike box behind when I encountered an obstacle, then leaving the suitcase and retrieving the bike. That’s how I got down the multiple flights of stairs into the Luxembourg RER station, where I bought a ticket to Aeroport Charles de Gaulle. The fare gate was equipped with a door to admit passenger with luggage, but it was locked. I stood contemplating what it would take to lift everything over the gates when a door opened next to the ticket agent’s office and a tall, neatly dressed and vaguely Yves Montand-ish personage appeared. He was going to open the gate so I could take my suitcase through. Then he saw the bike box. “What is it?” he said, in English. “But I brought it on the train from St. Quentin yesterday” — an irrelevant fact even though the St. Quentin train was also on the RER. “No. It is forbidden.” I had the feeling that was one of Yves’s most used phrases in English. I had no choice but to plead. I mentioned the fact my flight was leaving today, that I had to get home. I said “please” several times, and the desperation in my tone was not an act. In the back of my mind I was thinking that I’d already been told that a taxi wouldn’t carry the box and that a van shuttle was out of the question because the box was too big for that, too. How would I ever get this thing to the airport if this guy didn’t relent? Yves didn’t face me directly as I tried to cajole him. He looked at the dark ticket window. I heard him say, “It’s not fair.” Then I saw that Yves was looking at a younger guy in the ticket office; he said something to his younger colleague, who shrugged his shoulders. Finally, he said, “OK. But if you have a problem. …” “Yes — it’s my problem,” I said. Yves opened the gate, and I hustled my stuff down the stairs to the platform. The rest of the trip to the airport was without incident. (If you happen to travel to Paris, the RER trip into the center of the city costs 8.20 euros and is well worth it; just don’t make the trip with an oversize piece o’ pie bike box). But then there was the airport. As I expected, I had to do the same routine there that I had at the train station: carry one thing up an escalator or stairs, then go back for the other. Several times I had to leave my suitcase unattended. During one of my back-and-forth trips, when I’d left the suitcase at an elevator, I noticed three soldiers, two men and a woman, wearing combat fatigues and carrying automatic rifles. I rode up the escalator behind the woman, who stood facing backward down the escalator with her rifle carried at the ready. It was a little unnerving. The three soldiers got off ahead of me and very casually began walking in the same direction as my suitcase, about 30 meters away. Very casually, they stopped to take a look at it. Unattended luggage. A bag big enough to take out a good piece of the terminal if it were packed by unfriendly travelers. Oh, crap. “It’s mine,” I said. They turned and looked at me. I wasn’t even trying to communicate in French at this point, and I think that and my hapless appearance suggested that I was on the level as far as the bag was concerned. They motioned I could take the suitcase and go, and I treated them to a demonstration of my dual bag-hauling trick. At the end of the hallway, I reached a point where I had to go up a short escalator to the departure hall. Once more up with the suitcase, leaving the bike box behind. When I returned less than a minute later, three new soldiers were gathering around the bike box. I came back down the escalator, and one of the three said “what is it?” “Mon velo,” I said, a piece of French I was ready with. To my relief, they believed me, and told me to take it up on the elevator. I pointed up the stairs to my suitcase and said, “That’s mine, too.” Nevertheless, when I got up there a couple minutes later, two of the soldiers were regarding it with apparent suspicion. “Votre valise?” one asked when I came up. “Oui,” I said. She motioned for me to go, and I did the two-bag stunt again. I finally made it to the check-in line and handed over both suitcase and bike box. Now all I have to do is get that stuff through customs at home. But the thing that you have to keep in mind is not the number of people who did not finish, but the number who did: three thousand or more. Three thousand. Making allowances for the fact there are some riders out there who cheerfully face rain and cold and think nothing of it, even on a four-day marathon ride, that’s a whole lot of people who stayed committed to finishing. Congratulations isn’t a big enough word. I’m flying home in the morning. A great trip, but a little too long on the road for my tastes; and I have to say that the last few days, when I’ve been pretty much on my own, show me to be less than a perfectly content solo traveler. Oh, I love walking and walking around this place, but I really miss sharing it with my travel partner in chief. ‘Nuff said. Again referring to the Wikipedia, the towers are unbeloved by fans of church architecture. 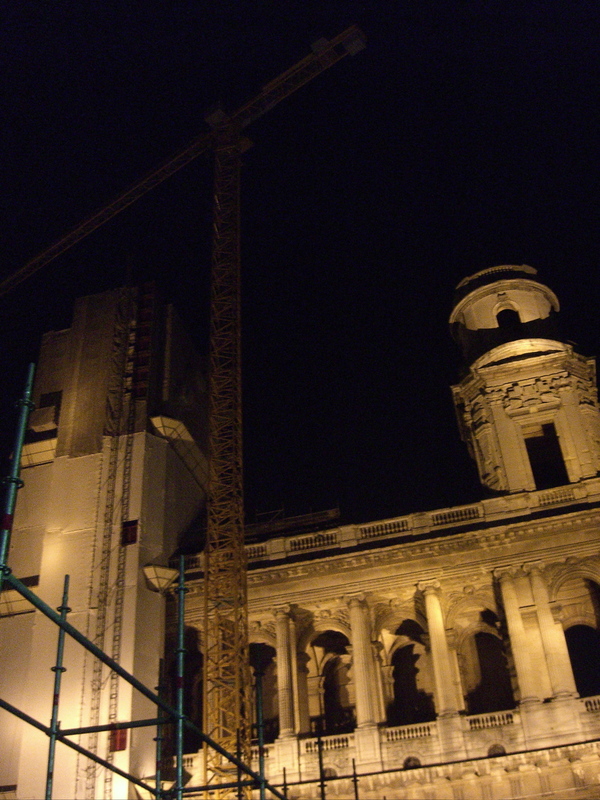 However, during the restoration or whatever is going on up there, the pair of them are quite striking in that sodium vapor light. As always, I’m surprised to find these old monuments are much more than that; St. Sulpice is still a working parish. My current obsession: How I’m going to schlep both my big-a** suitcase and my bike box to the Paris airport (de Gaulle) on public transit for my flight home Saturday. Wow — that’s making my pulse go up just writing it. There’s no doubt that Paris does commute trains, both subways (the Metro) and suburban lines, very well. But just like the New York subway, the Metro isn’t particularly conducive to hauling personal cargo. In the meantime, I’m camped out in a little hotel in the Latin Quarter called the Grand Hotel des Balcons. 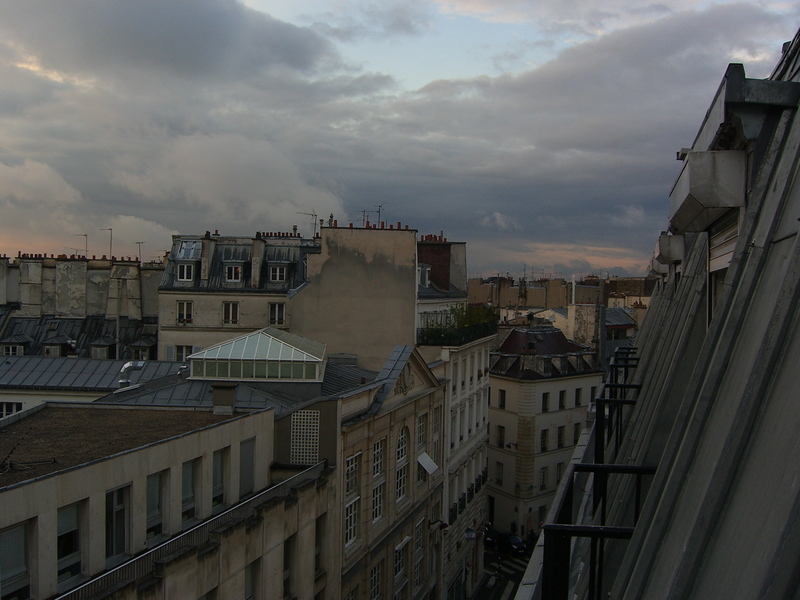 From what I can see, all the rooms in the hotel face west out onto the street, the Rue Casimir Delavigne. And every room has a little balcony. I’m up on the seventh floor (the top one), so I’m taken with the view even though I’m so close to the apartments across the way that I can practically inhale the occupants’ cigarette smoke. I should probably be brought up on charges for using a Talking Heads lyric as a headline. But that’s the good thing about being a Catholic, even a lapsed one — the prospect of Purgatory to mend all trespasses. So: I’m writing, and it’s not Friday, so what gives? I didn’t make it through the ride. Rain and a tender achilles tendon, not necessarily in that order, caused me to drop out just under a third of the way through. I’m a little disappointed, but not crushed. I’m not limping today, and I’m not riding in the recurring downpour I’ve heard outside the hotel all day. That, and chocolate milk and Pringles, have made this day better than yesterday. 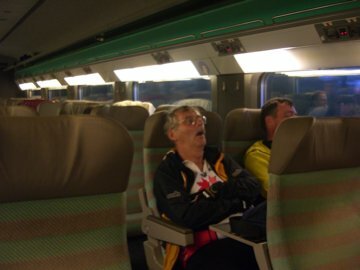 A lot of people have DNF’d because of the weather; the gentleman above, who hails from Ontario, Canada, is a fellow refugee on the morning TGV from Rennes to Paris. One of the advantages of getting off the road is that my mind is still clear about what happened; it wasn’t so clear after having done the whole ride in 2003. So sooner rather than later, a full accounting of my little part of the ride will be forthcoming. And for all those still on the road, bonne route et bon courage. … this here is PBP. The start is in four hours. I’ll be back Friday and will try to check in again then, repetitive stress notwithstanding. I’m more or less ready. Here was the triumph of the day, then I’m going offline: I put new tires on my bike early this afternoon. Naturally, since I lack the foresight to wear gloves during the messy part — some day I will! — my hands were full of grease afterward. I didn’t bring any of the nifty Phil Wood hand cleaner I use at home, and was wondering whether I’d just have to wait till the grime wore off since soap does very little to remove the gunk. Then inspiration smiled on me: Why not try toothpaste along with the soap — it’s got some abrasive material in it and it’s kind of soapy, too? I can report that soap and toothpaste are an effective hand cleaner after playing with a bicycle chain. OK — that’s it. Time to get ready to ride.